In recent years, the market price of cobalt has been experiencing a boom. Cobalt is essential for lithium-ion rechargeable batteries powering various things from portable electronic devices, such as smartphones and laptop computers, to electric vehicles. As the “clean energy revolution” takes place globally and the use of renewable energy grows rapidly, super-sized rechargeable batteries are attracting more interest, which is leading to the boom in cobalt prices. In January 2016, Amnesty International and African Resources Watch (Afrewatch) jointly published a report entitled This is What We Die For: Human Rights Abuses in the Democratic Republic of the Congo Power the Global Trade in Cobalt (in English, Chinese and French). The report revealed human rights abuses in artisanal cobalt mining in southern Democratic Republic of the Congo (DRC) and assessed the extent to which 26 companies had put in place human rights due diligence measures relating to the cobalt in their products. 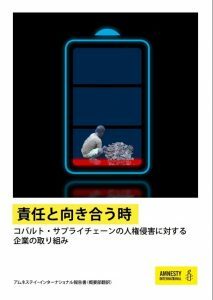 Under the supervision of Amnesty International Japan, we translated the Executive Summary in the report Time to Recharge: Corporate Action and Inaction to Tackle Abuses in the Cobalt Supply Chain into Japanese. In this second report in the series, they investigated and assessed improvements achieved over the last two years in the cobalt mining in DRC and companies’ approach to due diligence. As we were working on translation, we learned and employed terms used in the first report in full as well as referred to various sources to do an extensive research on general terms in human rights and supply chain contexts. There are approximately 110,000 to 150,000 artisanal cobalt miners in southern DRC, who have been working in poor work environment where human rights abuses prevail. All stakeholders throughout the supply chain need to clearly recognize the current problematic situation and take action for improvement as soon as possible. The DRC government should also enhance regulations to make the country’s pillar industries clean. Companies have been acknowledging that it is meaningful and significant to fully investigate and assess the current situation and progress and that the civil societies can be responsible for such initiatives as a third party. Not only cobalt mining companies but also manufacturers of electronic devices, automobiles and batteries are expected to improve their business practices, communicating actively with the civil societies. We consumers can also keep these issues in mind to make better choices when we buy products. As the first step, you can read the report to know the current situation of cobalt mining supply chain and companies’ attitudes toward it.